How Long Before Your Event Should You Schedule Facial Aesthetic Treatments? Whether you’re attending a gala event in Ocala or a holiday party in The Villages, Ocala Eye Aesthetics can help you look your absolute best. Ocala Eye Aesthetics offers an array of skin rejuvenation treatments and procedures that will help keep your skin healthy, youthful, and glowing through the stressful holiday season. If you’re pressed for time and need a revolutionary cleansing, exfoliating, and serum-infusing skin treatment before your big event, HydraFacial is your answer. HydraFacial is an invigorating treatment that can be given in as little as 30 minutes. It delivers long-term skin health and can be tailored to meet the specific needs of all skin types. Best of all, it offers noticeable results instantly, with no downtime or irritation. More than two million HydraFacials are performed annually worldwide. That’s more than the number of Botox injections given in the U.S. every year. We recommend getting any facial or mask three to seven days before your special event to allow you to recover fully and show off your youthful, healthy glow. If you’d like to take advantage of our paraben- and gluten-free Satin Smooth waxing services, we suggest making a separate appointment three to seven days before any exfoliation treatment. Radiofrequency (RF) skin lifting gently raises the temperature of the collagen in the deep tissues of your skin to product instant contractibility, which helps tighten skin, reduce fat, enhance luminosity, and reduce wrinkles. This collagen rebirth lifts the sagging skin under your eyes and on your forehead, cheeks, jawline, and neck. Patients typically start seeing results from RF within two to three weeks and usually experience its full benefits four to six months after the procedure. When scheduling your RF treatment, keep in mind that you may experience some mild redness, swelling, and bruising for twelve to thirty-six hours. BOTOX Cosmetic® is a prescription medicine injected into muscles to temporarily improve the look of moderate-to-severe crow’s-feet around the eyes and frown lines between the eyebrows. After your Botox treatment, you’ll need at least two weeks of downtime so that all redness, bruises, and swelling can fully heal. With other injectable dermal fillers like Juvederm and Restylane (hyaluronic acid), common side effects include swelling, redness, bruising, tenderness, and itching—not things you want to be dealing with as you prepare to carve the turkey! Depending on the treatment area, give yourself one to two weeks to fully recover. One of our healthcare professionals will be able to guide you in planning your treatments. 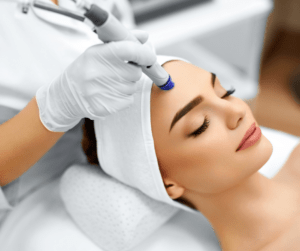 Microneedling is a minimally invasive procedure that very effectively treats fine lines, hyperpigmentation, and acne scars by stimulating the production of collagen and elastin. In the days following your treatment, you may experience some mild redness, tenderness, and peeling. We suggest giving yourself at least seven to ten days before a big holiday dinner to make sure you’re ready to go. Schedule a free skin care consultation with one of our licensed medical aestheticians to find out if you’re a candidate for microneedling and pick up your pre-procedure kit. Microdermabrasion is a painless, safe, and minimally invasive treatment that refreshes and rejuvenates your skin tone and texture. The procedure uses organic grains or a diamond-encrusted wand to gently exfoliate your skin, diminishing the effects of sun damage and improving the appearance of wrinkles, fine lines, age spots, acne scarring, and other skin conditions. Microdermabrasion typically takes less than an hour and you’ll usually see immediate results. However, give yourself a few days’ grace period for 100 percent peace of mind. Schedule a free skin care consultation with one of our licensed medical aestheticians to see if you are a candidate for microdermabrasion. The holidays are an ideal time to pamper yourself. Whether you’re welcoming out-of-town guests, visiting loved ones, or simply enjoying a quiet holiday season, you deserve to look and feel your very best. Our licensed medical aestheticians will work with your individual skin care needs and lifestyle in mind to ensure that you get the appropriate treatment and optimal results, all while assuring you have proper recovery time so you’ll be glowing for your next big event. If you’re considering a facial skin rejuvenation treatment and want to learn more, please contact us for a free skincare consultation. We’ll be happy to answer all of your questions and address your concerns.